NEW ORLEANS – While Rowan-Gloucester (N.J.) CC and Kingsborough (N.Y.) CC still sat in first and second, respectively, in both the men’s and women’s NJCAA Division III Outdoor Track & Field National Team Rankings, the remainder of the top-10 went through a shuffle. 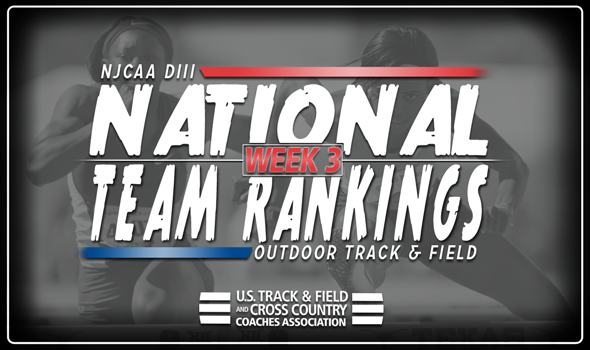 Six teams in the men’s rankings moved up in the top-10, while two teams on the women’s side gained some ground, announced the U.S. Track & Field and Cross Country Coaches Association (USTFCCCA) on Wednesday. But, as some teams increased their standings, a slew of teams in both rankings fell, as well. The Roadrunners ran its streak of first-place rankings to 10 consecutive-weeks, dating back to the fifth week of the 2016 season. Joshua Legg (400 hurdles) and Edgar Rosa (javelin) notched the top marks in NJCAA Division III in their respective events this past weekend at the Osprey Open and Multi Meet. The Wave followed Rowan-Gloucester (N.J.) in second place, marking six-straight weeks in that spot dating back to the middle of last season. The Wave’s 4×800 relay squad posted the top-time in NJCAA Division III this year at the Queensborough Relays over the weekend. Suffolk County (N.Y.) CC and Sandhills CC both moved up one spot each to third and fifth, respectively in the rankings. Suffolk County (N.Y.) CC benefitted from 14 top-10 NJCAA Division III Descending Order List marks this past weekend that included Cordell Nix’s NJCAA Division III-leading high jump mark. Sandhills CC’s Tyrese Kelly notched the top long jump mark in NJCAA Division III this season at the NCAT Aggie Invitational. Harper (Ill.) slipped to fourth in the rankings after sitting in third a week ago. The top-two women’s teams posted NJCAA Division III leading marks this past weekend to keep their spots in the rankings. Elisia Lancaster led Rowan-Gloucester (N.J.) CC with two NJCAA Division III leading marks in the shot put and discus at the Osprey Open and Multi Meet last weekend. Shantal Rouse paced Kingsborugh (N.Y.) CC at the Queensborough Relays with an NJCAA Division III leading 100 time, while the Wave’s 4×800 relay squad also recorded the top time in the division. Harper (Ill.) remained in third on the week. Suffolk County (N.Y.) CC swapped spots with Middlesex County (N.J.) CC, with the former of the two moving up to fourth. The fourth-place ranking for Sharks is the highest on the season for the program.